I get high blood pressure when I walk by certain sections in the grocery store. The salad dressing aisle is example 1A. Last time I checked there were approximately 4,000 different salad dressings you can buy in the grocery store. Many of them are some combination of salt, sugar, cheap oil, and a few pinches of spices. But, in their defense, they are super convenient. If the step that gets you to eat more salads in your life is having convenient salad dressing in the fridge, then cool. But, I thought I’d show you all how I’ve been rocking salad dressings recently. Essentially, I make up big batches of just the dried spice mixes. These keep for months and months. Then when you want a batch of homemade salad dressing, you just add some of the mix to a few simple ingredients and you’re ready to go! 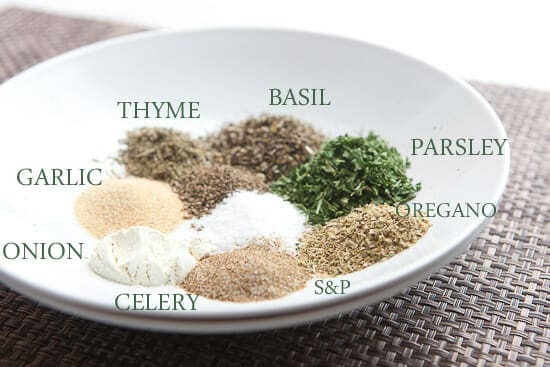 I didn’t do the exact calculations, but I’m pretty sure that if you buy these spices in bulk (not in the little containers, but at an actual spice shop), these homemade salad dressing mixes are cheaper than the same amount of salad dressing from the store. 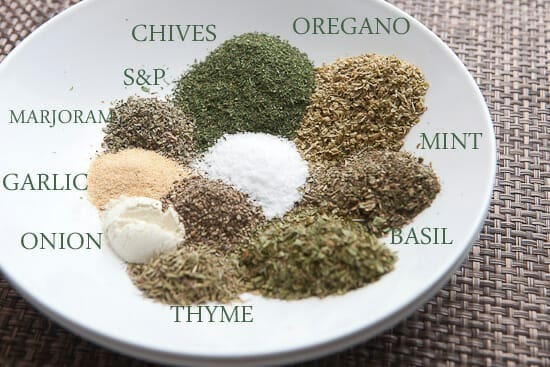 Simple homemade salad dressing mixes for ranch, Italian, and Greek. Each includes a few simple dried spices and then you just have to add a few ingredients. 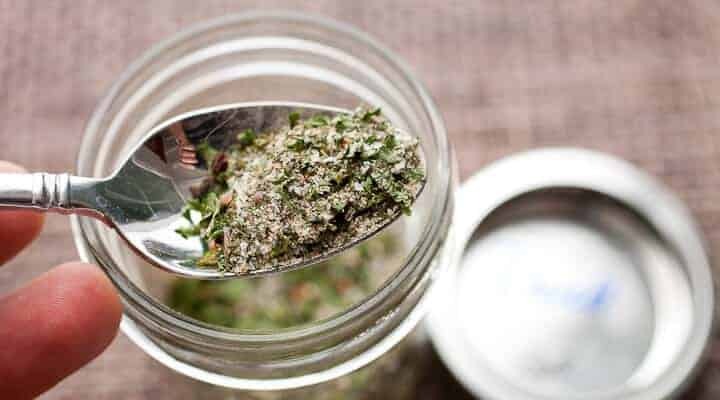 For each dressing mix, combine ingredients in an air-tight container. 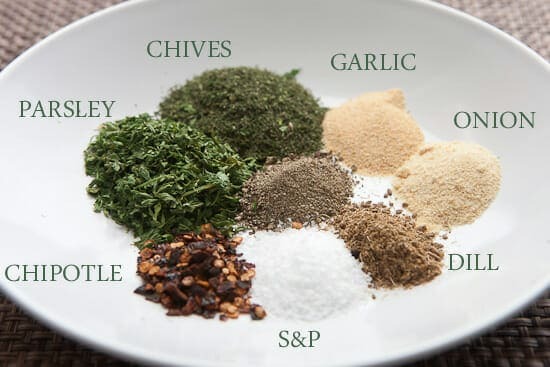 Dressing mixes will keep fine for 2-3 months in the pantry. Mix each dressing by whisking ingredients together or adding to a jar and shaking vigorously. Mixed dressing will keep for 1-2 weeks in the fridge. You can also adjust mix amount to your liking for each dressing. These mixes look long, but they are all pretty basic actually and have easy-to-find spices. Nothing too exotic. Also, all the mixes include sugar, salt, and pepper. I tried leaving the sugar out, but I found that a little sugar really helped the flavor. It’s still way less sugar than most jarred store salad dressings. You could try the mix without sugar though and then always add a little honey or something to the dressing later if you wanted it. 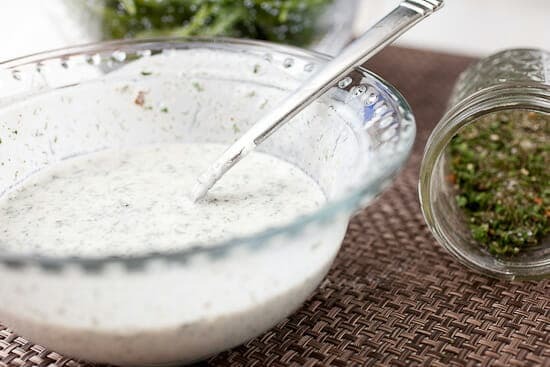 Ranch dressing is something that I usually buy at the store if I’m in a rush, but the flavors are actually pretty easy to nail down. I like to add some spice to my mix with some dried chipotle pepper flakes, but that’s optional. Leave it out if you want a more traditional dressing. To keep the dressing on the light side, I mix it with yogurt and buttermilk (instead of mayo). It’s packed with flavor. You could also thicken the dressing with more yogurt or some sour cream and it would be a perfect veggie dip. Italian dressing is a pretty vague term. The only real rule (in my opinion) is that it has olive oil and vinegar. The spice mix is pretty up to you. This mix that I use though gets pretty close to the “store-bought” Italian dressing flavor. It has a little more flavor to it though. I find I need less of it on my salad because of that. A little goes a long way and the mix would last you a long time even if you eat salads every day! This mix makes the largest amount of mix. It’ll fill up a small canning jar about half way. I just stuff in all kinds of dried herbs and the resulting dressing is pretty intense. Personally, I love the mint in it. It really makes the flavor pop. The only other difference in this mix and the Italian mix is I like to use white wine vinegar for the Greek salad dressing. This kind of shows off the herbs a bit more. The truth is that you could use either vinegar for either mix and be in pretty good shape. Since the homemade salad dressing mixes are completely made of dried spices, they will keep beautifully in airtight containers for months. I’d say after 3 months though the spices will start to really lose their flavor. Once they are mixed in a dressing, they will last 1-2 weeks without too much issue. The ranch will have the shortest shelf life thanks to the dairy. 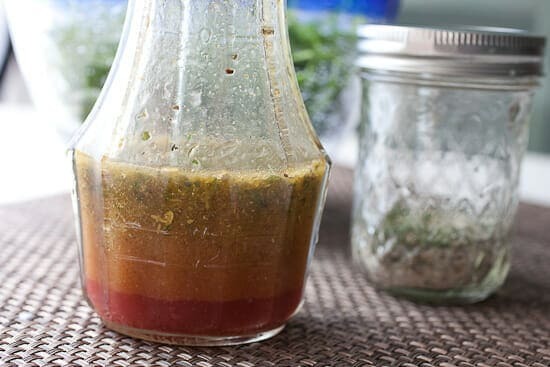 Help spread the word on how easy salad dressings can be to make at home! Here’s my little visual guide to all these mixes. Facebook it. Pinterest it. Save it as a reference!! Don’t forget the House Dressing! That is a favorite in our house from the 5 year old to grandpa. Yea… that’s one of my faves for sure but it’s hard to make in advance. It’s kind of a make it as you need it recipe. Wow, what great shower gift, salad bowl, utensils, dressing jar and all the herbs packed in separate bags ready to be used on a moments notice. Love this , Nick. You are an insperation! Knocked it out of the park, Nick! Nice job. These are also great “instant marinades” for grilling too. I haven’t been able to eat store bought dressing in years. Yuck. After studying abroad in France, my go to dressing has been theirs: olive oil, balsamic vinegar, Dijon mustard and sea salt. Simple and perfect. If I want ranch I have found a cheap and healthy alternative: generous amount of canola mayonnaise, some Dijon, a clove of pressed garlic, a little lemon juice and fresh ground pepper, then thin with water to desired consistency. Also good when made with a little chipotle flavored mayo! I agree with Ellen… good olive oil, lemon or balsamic vinegar, Dijon, crushed garlic, salt and pepper. My latest fave, however is only 3 ingredients: 1/2 c light mayo, juice of 1 lime, and a handful of fresh cilantro. Throw into your ninja or food processor or blender. It’s addictive! 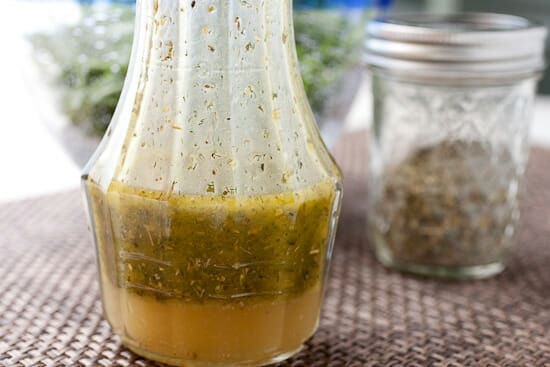 Nothing better than a homemade dressing. Thanks for these great dressing choices. I grew up in an Italian-American household (immigrant grandparents from Naples) where nightly we had fresh salad dressing made on the salad with olive oil, wine vinegar, garlic powder, basil, oregano, salt and pepper. To this day I make this most days and absolutely can’t stand bottled, store bought dressings. I will greatly enjoy being able to mix it up with some other flavor combos. Thanks! That’s how I grew up eating salad, too. No garlic powder; my mother would rub the salad bowl with a crushed clove. Salt, pepper, oregano, basil & thyme directly on the salad. (And that can be done ahead of time.) When ready to serve,drizzle with olive oil and red wine vinegar. Toss. Eat. Heaven.